This cat greeting card is the perfect Mother's Day card for a Game of Thrones fan! This card can be fully customized and personalized at no extra charge and also includes a free matching colored envelope, round envelope seal, and a U.S. Forever postage stamp. 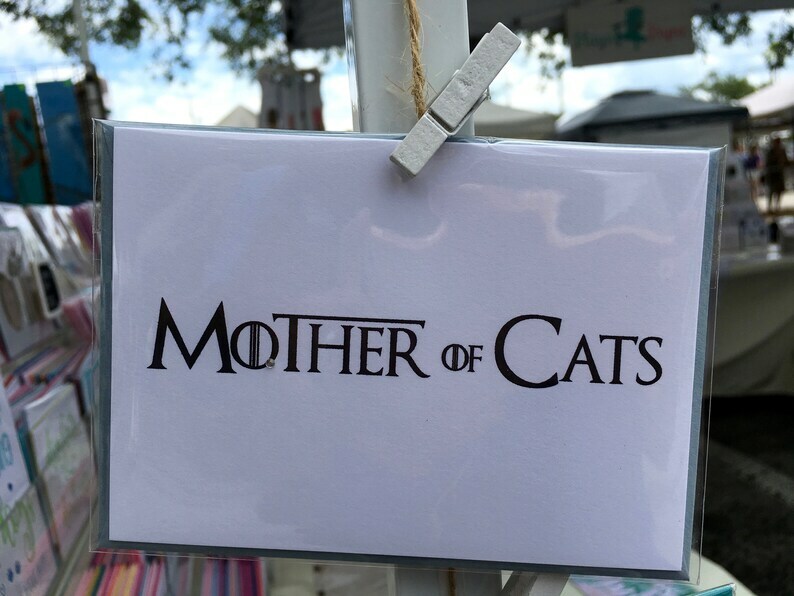 On the front of the card, there is the message, "Mother of Cats," which is a play on the Game of Thrones character, Daenerys Targaryen, from the House of Targaryen, who is the Mother of Dragons. The card measures 4.875” x 3.5” (A1 notecard size) when folded and is blank on the inside. If you prefer a larger greeting card size, please select 5.5" x 4.25" (A2 size) from the card size options. Your handcrafted, Game of Thrones card will be individually printed in my home studio so you can further personalize it by adding any name you wish on the back of the card as shown on the photo. Provide the name(s) you want printed in the Notes section.